‘Let it rip!’ – That iconic phrase echoes in the memory of thousands who grew up watching the Beyblade anime and it resonates true with the entire premise of the series. That being fast paced action with an addictive game at the core of it all. That addictive game is Beyblades, a spin on the classic spin top style game, with players challenging each other to see whose Beyblade will be the last standing. In classic anime fashion, the Beyblades of course contain magical monsters that can battle one another. Kids nation-wide enjoy the Beyblades series and addictively collect the physical Beyblade spin top merchandise. While the real life Beyblades may be addictive, does that addictive nature carry over to this video-game, Beyblade: Metal Masters? Fans of the Beyblade: Metal Masters anime series will be sure to enjoy this games story which focuses on the ‘Nightmare Rex’ story arc. 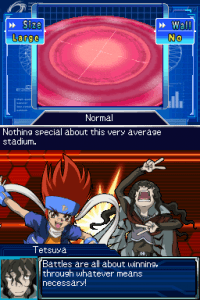 Characters battle in a Beyblade tournament at a cemetery of all places. It works well for the arcade mode in which it features, but unfortunately once the arcade mode is completed (which can take about an hour at most) there is literally no other story to continue playing, it’s just over. I was disappointed to say the very least, but fans of the show should have enough fun playing against all their favourite characters from the anime series. However one major gripe I stumbled upon is that, the majority of the characters speak in broken English most of the time, due to a clearly poor job done by the translator. In the end though it is more humorous than damaging to the game. Let me start off by saying this; there was a lot of potential in Beyblade: Metal Masters. As you can imagine I say that because it never achieves what it’s potential promises. Instead the gameplay turns out to be an inconsistent mess with a control system that makes little to no sense and necessitates the instruction manual in order to know how to play. The haphazard control system is a good place to start. It’s biggest problem is it’s lack of common sense. The very fact that it is pretty much impossible to play without consulting the instruction manual (an action the game actually asks you to take) for contols, is a red flag right there. Put simply, the controls are overly complicated and ultimately require the player to button mash and hope that they win. This control issue, creates another problem – there is no strategy. You essentially win matches by seeing how fast you can mash the buttons (an action that is also required to launch your Beyblade funnily enough). If you go into the game thinking that there would be some more strategy to the control system and gameplay mechanics, you are quickly proven wrong once you figure out how to actually play. 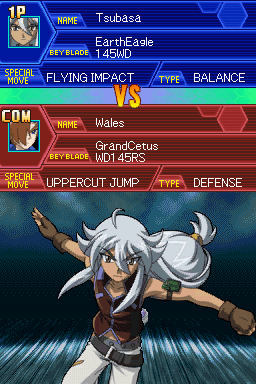 Thankfully it’s not all doom and gloom, while the actual battles are monotonous and control terribly, there is actually an in depth Beyblade customization system that redeems a lot of the games poorer qualities. The system is deep and allows a great deal of choice in how a player wants to craft their Beyblade. 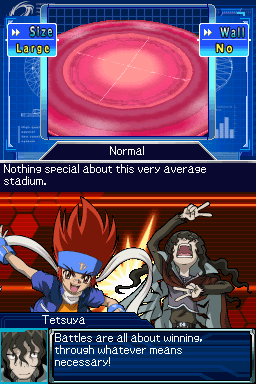 It would certainly be a nice treat for fans, wanting to recreate their real life Beyblade in game. 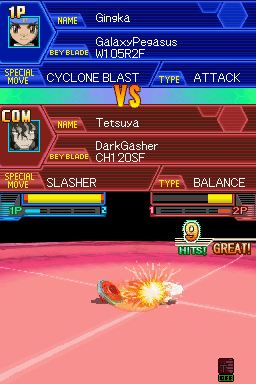 From a visual standpoint, Beyblade: Metal Masters is exactly what you’d expect, a largely 2D game with semi-3D battles. Sure it is true to the series, but it just makes up an overall boring aesthetic design for the title. Which is really disappointing given the visual delight that the anime series can be. If the game’s graphics and presentation could support the action and energy of the anime then it would’ve been a much more better visual product in the end. Sadly it ends up being bland, in every sense of the word. Thankfully there is a silver lining, that being the games soundtrack, which is a pleasure to listen to during gameplay. It provides a well suited backing for the game and makes up for the majority of the excitement and atmosphere of the game. All in all, like the rest of the story and gameplay, there is just as much inconsistency here, which really lets down something that had so much potential. 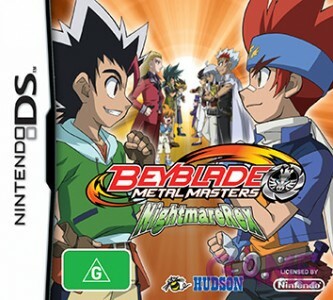 In the end, this is a Beyblades game for the Nintendo DS, it was never going to be a gaming masterpiece. It could have at the very least however been a great game. Especially when you take into account how much potential a franchise such as this has to make a great video game. That is why it is a very sad thing to say, that Hudson has made a grave misstep in the production of this game. It simply required so much more polish and attention to the finer details. All things that Hudson seemed to have completely overlooked when they were constructing this incredibly ill-conceived anime tie-in. If you are a fan of the anime series, there have been better Beyblade games in the past that you would probably enjoy more than this. But there is enough here for fans to garner some level of enjoyment from. Just don’t expect to not notice the glaring problems that plague the title from the minute it starts.